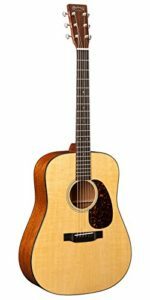 Martin D-18 Review – Can It Be Considered The King Of Acoustic Guitars? 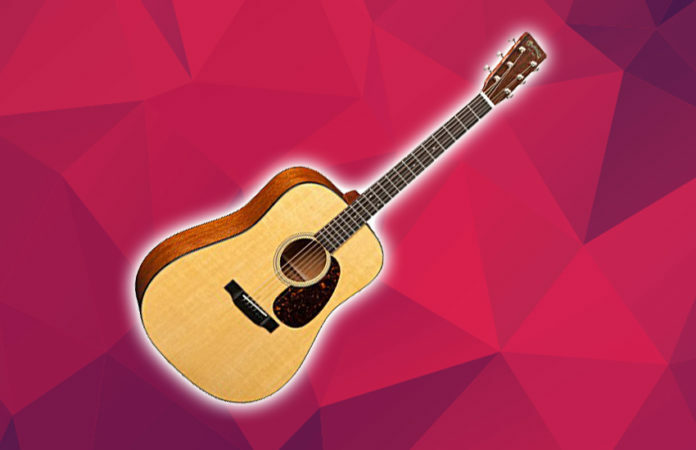 Martin D-18 is one of the best dreadnoughts out there, and it earned its spot on our best martin acoustic guitars list. 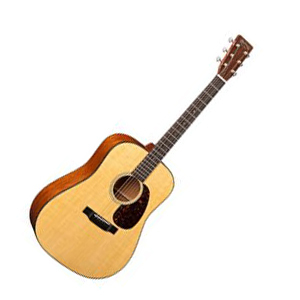 That simply shows what an acoustic guitar is able to do, with a great sounding combo of solid Sticka spruce top and mahogany sides and back, a smooth fingerboard, a bone nut and a saddle for improved intonation, so as you can see, we are talking about a high-end acoustic guitar that will not disappoint you in any aspect. To begin with, the D-18 consists of a solid Sitka spruce soundboard with a fairly tight, straight grain. Additionally, the back and the sides are constructed from solid mahogany, while the two-piece back is separated by a simple black Boltaron pinstripe. Both the back and front are joined with tortoiseshell effect binding, which meets the pickguard, and the soundboard binding is expanded with uncomplicated black and white tinted Boltaron coachlining. Moving on, the one-piece mahogany neck is satin-finished, which is suited to the body employing a dovetail joint and the fit and craftsmanship is first rate. To be more specific, each joint, line and fixing is superbly finished, which means that Martin’s expected high standards of presentation are reached, if not bettered here. When it comes to the bridge, well, it is made of solid black ebony, and it has the ’30s style belly with a drop-in saddle, while the string spacing at the bridge is 2-3/16 inch and the radius of the intonation-compensated bone saddle is a flat-feeling 16 inch. Also, the tuning machines are nickel open-geared models with butterbean knobs, and the pickguard is a tortoise-colored Delmar affair, which means the D-18 comes strung with Martin Studio Performance Lifespan Phosphor Bronze medium gauge strings. In terms of aesthetics, when you first pick up the guitar, there’s a sense of gravity, importance, history, because if you didn’t know, this guitar was there through the early days of country and western, through rock and roll, through folk. When it comes to the tonality, well, this particular model of Martin Dreadnought is known for producing more crisp and smooth, powerful yet controlled tonality than its predecessors, reacting speedily with precision and to the slightest change in dynamics. If you play this guitar softly, the tone becomes delicate and reasonable, while if you pick it harder, the top start vibrating, so this tells about how realistic this guitar can be. While if you strum with all your force, a beautiful natural confining transpires as the top and the body reach the limit of their volume capabilities. Moreover, during our research, we didn’t really find any remarks regarding this guitar, due to the quality abovementioned and its breathtaking performance. Now, Martin could have continued to offer multiple D-18 versions, but of course, the decision to reach the model to its most high-end core really reinforces the singular influence of this model and its history. Overall, the D-18’s price may not be affordable for some, but if you have the budget for it, don’t hesitate to purchase it because you will be assured of its quality and performance which will last for decades until it becomes antique to your children and nephews.